Today’s car-respondence covers part-timers, unnecessary surgery, Caribbean catastrophe, MINI-mum requirements, orthopaedics, and enough to keep you going until the teapot runs out of tea. Our group of pals includes two fellas, both late 50s and recently early retired. One is very happy about having exited the workplace and the other less so, to the extent that he has secured a job with the local council as a "lollipop man" for school term times and both have informed their insurance companies part way through the premium year. For the sake of the discussion, all other things being equal, which of them will, at the start of a new insurance year, pay less than the other? A few of us reckon it will be the one who is fully retired, because he has no commuting anymore, annual mileage is less. The rest think it is our pal with the hi-viz and pole, who has gainful part time employment/regular work hours over term times, although is this wee job considered "risky" by insurers? Both say mileage will be under 5,000 per year. Very soon after delivery of my April 2016 Mercedes Benz B200 automatic, when changing gear from 1 to 2 and also 2 to 3 there was a strong surge forward, even when going slowly. It only seems to arise in town when moving off and seems when going downhill. It is accentuated when going down a slope and frankly is very dangerous. I took it back to the dealer who checked the software relating to the gearbox and indicated it was not a known problem. Nor did he discover anything out of the ordinary. I can go for long periods before the situation arises again. I do not understand the current Auto Boxes fitted, in particular the type fitted to this car, and believe they are now the current trend. The term “double clutch” comes to mind. Any help or observations would be gratefully received. Yes, it has a '7G-DCT' (Dual Clutch Gearbox). The idea of this is two shafts of gears and that the next gear up or down 'pre-selects'. I would guess that what is happening to yours is that the engine revs are not reducing when this happens and, providing the various sensors are doing their various jobs, that would normally be a software issue. The dealer has checked the software and found that to spec, but I don't think he has looked for a sensor error such as the mass airflow sensor giving an incorrect reading and that would affect the operation of the transmission. I live in Saint Maarten. I have a Golf 1.6 that I bought from Caribbean Auto in St Maarten less than one year ago. The transmission acts funny. I sent the car back to the company. They say they can’t find the problem. Please any help. I intend to change my MINI One next year. Ideally I would prefer a 5 door automatic with sunroof, heated front seats; everything that comes as extras. Best bet would be an ex-demo model, but to get what I want and a colour I could live with, could be a very long wait. I quite like the new Countryman, with the back opening doors (pricey). There is the old model, but resale would be poor, especially as I keep my cars for about 5 yrs/70,000 miles. I've also like the FIAT Panda 4x4, as it is chunky and has more appeal than the basic Panda. However, I don't really need a 4x4. I also read that fuel economy is poor. I may be “of a certain age,” but really don't want a Honda Jazz, Yaris, or Peugeot. I like car design, but need a small classy hatch back. It has to accommodate grandchildren, art equipment, dog. I like a high driving position (not in a MINI). Has to have light steering (recently had a hand operation, so may be preferable to have automatic). Trouble is I've had MINIs in the 60s then returned to them in the early 2000s, but they are expensive. Can I drive anything else? I have a petrol manual Suzuki Vitara S that is 8 months old with 1,500 miles. It’s a fantastic car but I have developed back problems and can’t get on with the seats and am not driving it. So I have got to sell or exchange it. Can you advise the best way to do this? I would like to buy a similar sized automatic SUV/MPV with comfortable seats and a higher seating position. I am looking for a demonstrator if possible as I know there will be a loss on the Vitara. I only do about 3,000 miles a year and had thought of the Citroen C4 Picasso. Is this a good choice or are there any other cars I should look at? That is a drastic decision. It would be better to consult an orthopaedic specialist such as Otto Bock and have a special seat constructed for the car than go to the colossal expense of swapping it for another car. My 2006 Honda Jazz jerks randomly. I’ve taken it to Honda and they reckon it's the CVT fluid that needs changing. At the time, I told them we've just had the fluid changed but they insisted that was the only issue they could find. They also drove the car and didn't experience the jerking problem. This was at the beginning of the year, which was when the issue started. I took it for servicing last week and mentioned the issue to them. They again drove the car and didn't experience the issue. Even did a diagnostic test to see if any error code will show. Nothing did. I wondered about the suspension, but the garage said the suspension was checked as part of the servicing and it was fine. The issue is now happening frequently now so I'm also thinking of taking it to quick fit or is it quick fix? If the CVT fluid has been changed (and the correct fluid used), and the clutch pack is okay, then it could simply be that the transmission is starting to wear out. We live in a small mews in London and park our car in the garage, which has a 2,100mm garage door (2,500mm once inside) and is 4,530mm long (plus another 270mm if we get rid of some shelving). We have had our Renault Scenic Megane MPV Dynamique since 2004 and, whilst it is in good condition with only 22k miles as it tends to do long miles every school holiday but only occasional short trips so mostly sits in the garage. We are aware that the Mayor for London is bringing in his Toxic Tax and Ultra Low Emission Zone charges later this year and next year and that a change of car is going to be forced upon us. We'd like your advice on what we might get to replace it? I have an elderly mother who likes the height of the MPV and a child off to boarding school, so space for a trunk is a must. The Renault has suffered from a few hiccups including failing windows, where we had to have the motors replaced and a few other ailments, so we'd prefer to look for something more reliable. Have you any suggestions, given it has to fit in the garage too? It's been an age since we bought a car, and will probably be an age till we buy the next, so can you suggest something that will last, meet the Mayor's new rules and preferably be a bit of fun too as we'll be doing more driving now too. Not sure on budget. Had been thinking £20-£25k but just priced up a BMW 218i on line and it added up to £28k+, so maybe £30k max. What sort of money or trade in would we get for the Renault? It’s silver with panoramic opening roof and air con. The Renault isn't worth much. Maybe £1,000. If you part-exchange it, actually nothing because the dealer will merely take whatever he gives you in p/x off any discount you might otherwise have been able to negotiate. You could try webuyanycar and/or wewantanycar, but if they don't actually want your car they will merely bid you with a derisory offer, so you could be forced to sell on Autotrader or eBay or Gumtree. 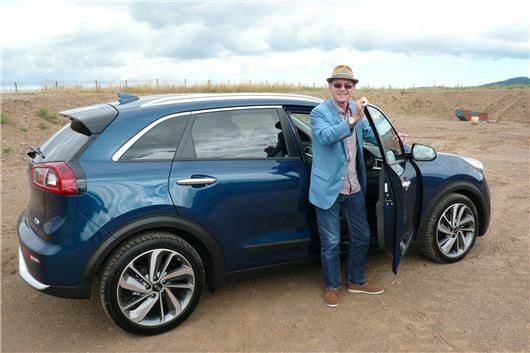 You could consider a KIA Niro hybrid as that will go down well with Mr Khan, and they now do a plug-in Niro hybrid, assuming you have electrical power in your garage. Another possibility is a Hyundai Ioniq hybrid or plug-in hybrid. Or maybe a Toyota Prius Plus hybrid (ugly thing) like the taxi drivers use. Last year I bought a 2012 Land Rover Discovery 4 but, unfortunately, 12 months later the engine has failed under normal driving conditions on route to work. Inspection by our local Land Rover dealer confirmed that the engine had ceased and required replacing at a cost of £14,196.62 plus VAT. Subsequent research has shown this is known fault on Land Rover Discovery vehicles of this age and has been acknowledged (and fixed on later models) in Land Rover’s Service Bulletin SSM71816 that was published in 2014. Having owned the vehicle for little more than 12 months I cannot now outlay a cost equivalent to replacing the vehicle for a new engine that has failed due to a problem known to Land Rover. Land Rover is offering 40% contribution but this still leaves me with a repair cost in excess of £10,000. I have requested JLR cover 100% of the cost but they have stated that 40% is their final offer. I can’t accept this. Can you offer any advice or assistance? My wife recently parked in the Royal United Hospital, Bath car park that is a number recognition park (managed by Parking Eye) and purchased a ticket on leaving for the correct amount, but unfortunately keyed in one incorrect letter (the remaining numbers and letters were correct). She received a parking charge notice for £80 (£40 if I paid within 14 days) and wrote explaining her mistake and enclosing a photocopy of the ticket, proving payment, with the letter error highlighted. She has not heard from Parking Eye and I would be grateful if you could advise whether it is safe to assume this absence of acknowledgment of her letter of appeal means her explanation has been accepted and the charge cancelled, or does the mistake mean she can still expect to have to pay? Can't tell you. If not, and they pursue it. I'd like to see someone take such a case to The Supreme Court because, as it is, parking operators are using Beavis v Parking Eye, Supreme Court, November 2015 as a carte blanche to enforce all kinds of unfair penalties. The law needs to be clarified in cases of wrong keying in of a registration, ticket machine failing to deliver a ticket, and driver returning to same car park same day and being penalised from the first time they entered the carpark. I have a Suzuki Vitara SZ5 Automatic 4x4 1.6 petrol, new with only 1,800 miles on the clock. When using cruise control at 60-70 mph, the automatic gear change seems to become very erratic and undecided, shifting up and down at the slightest incline, making the ride uneven and uncomfortable. I consulted the Suzuki dealer from whom I bought the vehicle this year and they told me this is a normal situation due to the 4WD system. I cannot understand that this is 'normal' in a top of the range Suzuki Vitara and would be most grateful for your advice/comments. You might be expecting too much of the ordinary 1.6 petrol engine, automatic transmission and four-wheel drive. The Vitara we recommend is the S with 140PS 1.4T Boosterjet engine. Try selecting 2WD for everyday running. Only select auto AWD when you need it for extra traction when driving cross-country. I have received a notice of intended prosecution for driving at 35mph in a 30mph limit. I believe a tolerance of 10 percent plus 2 mph is allowable and if so this means 35mph is allowed before prosecuting me. Please advise if I am correct, and, if so, how I respond to the intended prosecution. No, you are not correct. The allowance was only ever advisory and varies from one police area to another. 31 in a 30 is exceeding the speed limit and if they're feeling nasty they can do you for it. If you are offered a 'speed awareness course' instead, take it. Waste of a day, but means no points on your licence. I live on the Isle of Wight and own a 2014 Chevrolet Spark 1.2 which met all of my requirements: roomy enough for the school run, economical for commuting and nippy along the island’s roads. Unfortunately, a few months after the warranty period expired, it refused to start: the engine turned over freely but it would not fire. After checking the basics myself I called a mobile mechanic who (like myself) noted that the fuel pump was silent, so he bridged the terminals and it could be heard running. He was unable to read anything from the OBDII port as he did not have the required software so recommended a diagnostics specialist. My Spark was then trailered to the workshop, but they could not communicate with the ECU in order to isolate the problem. They rang a couple of the nearest Chevrolet Service Centres (there are none on the island) to request schematics in the hope of tracing the fault, but were either left on hold or told that nobody was available to talk to them. I spoke to the Service Manager at my local Vauxhall dealership, who was sympathetic, informing me that when Chevrolet pulled out of the UK they severed communications and information sharing with their Vauxhall colleagues. I also fired off emails to Chevrolet, Vauxhall and General Motors asking for wiring diagrams or a technician to liaise with my guy at the workshop. All requests were met with the same response "You will need to take your vehicle to a Chevrolet Service Centre.” I am now left with a non-functional car that has covered less than 16,000 miles and apparently have no option apart from transporting it on the ferry (approximately £200) to be checked out on the mainland. Even if the car is fixed I could, potentially, be in a similar situation in the future. Do you have any suggestions? According to the Chevrolet website (that might be out of date) the Chevrolet dealer for Portsmouth is Seward Havant of West Street, Havant PO9 1LT, tel: 02392 455455. However, the first and most obvious things to check are the low pressure fuel tank lifter pump, its relay, and the earths to the lifter pump and relay. Then the high pressure fuel pump that you know is working, but you need to check its relay, its earth and the earth to the relay to make sure it will work with the car. I don't think the problem is serious. Just something like an earth wire dropped off or chewed by a rat or something like that. It's possible that a local <car electrical specialist> (http://www.yell.com) on the island can trace the fault and fix it. Your car is actually a Daewoo M300 built by GM Daewoo, South Korea and is marketed in other countries as the Daewoo Matiz (but is not to be confused with earlier itertations of the Matiz). Though it may have been built at the Halol Plant near Ahmedabad in Gujarat, India. That information may help you to fault-find in the Internet. I've narrowed what to choose down to two cars. Can you give me your opinion please? Car one a 1.5TSI Eco Golf. Car two a MINI Clubman 1.5, both petrol. What is the merit of both as auto or manual? Will either need expensive cambelt changes? And which will hold its value better please. The Golf has VAG's new 1.5 4-cylinder engine with 130 or 150HP. Too new for any problems to have developed. But I checked and was told it still has VAG’s 7-speed dry clutch DQ200 DSG. The long MINI has a 3-cylinder 1.5 engine that had problems with its crankshaft bearings a few years ago but they were resolved. The automatic is 6-speed torque converter. I bought a car on 4th July from a dealer for £4,500. He delivered the car on a flatbed and, on taking it off, he damaged the suspension, which snapped. He apologised and took the car back for repairs, re-delivered the next day. Then, whilst driving, I noticed a slight noise from the engine area. By the next day the noise was worse. I called him and he agreed that it was probably due to the incident. He told me to go to local garages and get quotes. I got quotes and when the garages were checking it out they said there was a noise from front wheel, same as where the suspension broke and that it was coming from the rim. I contacted the dealer. He disagreed and said someone will contact me the following day to arrange a pick-up. Next day, driving I noticed more faults: shaking engine, unstable and vibrating, plus unsmooth gear changes, all of which were not present on my test drive. The dealer called and asked when I can bring it in. I explained this would be difficult for me as it is 45 miles away and I have 3 children. How would I get home. I was told to take a train. I had no choice and agreed. On worrying about it and becoming very anxious about the car with all the issues I started getting upset and scared of future repercussions. I texted the dealer and asked of the possibility of rejection as car was not satisfactory to me. They said no. I had to take car there to be fixed although I told them I knew about the Consumer Rights Act 2015. They said I wasn't right. I then sent them a letter and am still waiting to hear back. What do you think my chances are? Do you think I have a case? I think you need to reject the car for a full refund. If you are on your own, then better to pay for a solicitor to help you do it properly. Law here: /faq/consumer-rights/ I think the dealer is bullying you and trying to take advantage of your situation, so warn him you will also seek to recover the solicitors fees from him. My son is driving a Ford S-Max and it is time for him to change. He is looking at the Discovery Sport 2.0 Diesel HSE Automatic. What is your view of this car and what similar cars should he be looking at? I’ve been looking at a 2013 Golf 1.6TDI Bluemotion for my wife. She loves the look of the Mk7 Golf. I know the previous model suffered EGR issues, so what are your thoughts on these, or are we better with a petrol? The current Golf VII 1.6TDI has the newer EA288 engine that is low NOx to start with and is not affected by the recall. But Golf VIIs have not been problem-free: /carbycar/volkswagen/golf-vii-2013/?section=good/ I’d wait for the new Golf 1.5TSI Evo 150. I’ve got myself a 2003 MX-5. The tyres are low profile. As I am getting on a bit I would like a softer ride. Can I change them for ordinary tyres? The original Mazda MX-5 came on 14-inch wheels with 185/60 or 175/65 R14 tyres; the next MX-5 1.6 came on those sizes or 195/50 R15 tyres; while the 1.8 had 16-inch alloy wheels as standard with 205/45 R16 tyres. The 2005 1.8 has 16-inch alloys with 205/50 R16 tyres and the 2005 2.0i had 17-inch wheels with 205/45 R17s. So quite a lot of choice there. Whether you can fit 15-inch or 14-inch wheels to your car will depend on the size of the front brakes. You probably can't fit 14s. We are planning retirement and want to buy a car that won't demand on regular income. We can pay cash, but dealers seem always to want you to take a loan agreement. Do they value cash purchases? Or is a PCP the best way? No. If you can pay cash, pay cash. A PCP traps you. A cash purchase doesn't. And the funding of a lot of PCPs is starting to look decidedly dodgy. It’s the reason why so many people are driving around in cars that they would not normally be able to afford. KR makes the common mistake that ten percent plus two is the discretionary max speed, i.e. no ticket until 36. When discretion is used ten percent plus two is the point at which a ticket will be given. 35 in a 30 is correct. Regardless 35moh read probably means a speedo reading of 38-40, so no excuse.